This is post #12 from the 30 Day Personal Finance Challenge: Boost Your Financial Health with a Daily Tip! Now comes the long expected question – how the hell am I going to pull this off in 5 years? How will I get to financial independence? It’s a complex and simple question at the same time. 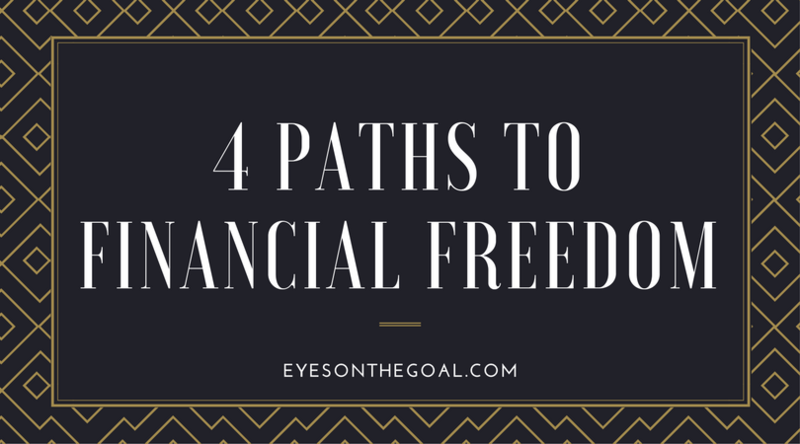 Let’s first define what financial freedom means (at least to me). My focus is on simplifying my lifestyle so that I need less. It doesn’t mean to become rich. It means to have a low consumption lifestyle and the freedom to choose what kind of work to do. Jake himself quit the rat race at 38. He built a profitable, value-producing business. He and his team developed software to analyze accessibility of street networks. He sold the business to a large engineering company and now he lives out of passive investments. This is the first idea that comes to your mind when you think about financial success – start a business, get to profit and sell it. BUT this is really, really, really hard! It’s not for everyone. It requires full commitment and a huge risk to your creditors, employees, and family. Forget traditional career steps. You decide to only work on things you love. Keep very low expenditure. Build multiple income streams. This means you can have lots of different mini-jobs instead climbing the proverbial career ladder in the traditional way. You still work to support yourself, but it doesn’t feel like work because you love it. It’s faster to start doing it as compared to the other ways. Downside: You need to have an extremely frugal lifestyle. This is usually for people on a stable, long-term job with regular income. It requires extreme saving and a frugal lifestyle. You have to cut all crazy consumption habits. Invest the money on a regular basis and rely on the power of compound interest. After you save enough, you quit your job and live off the interest on your savings. Maximize your delegation and make sure you build it in such a way that you don’t need to be there every day to manage it. Once the business runs without you investing time into it, you live from the long term income from it. Here the keywords are “standardization, optimization, automation”. Start a business, get to profit and sell it. Note that you might need to stay to integrate the business. Once you are out, default to extreme saving. You can combine strategies. The message here is: a successful start-up is not the only path to financial freedom. If you are willing to invest time upfront into a passive income and to change extremely your consumption habits, you also have a chance. It is all about deciding which trade-offs you are willing to make to reach the goal. For myself, I have chosen a combination of intensive saving and building passive incomes. * I will write about these three paths in bigger detail and provide some examples and resources in future posts. Meanwhile, you can check out Jack’s Four Ways To Quit The Rat Race Youtube video.